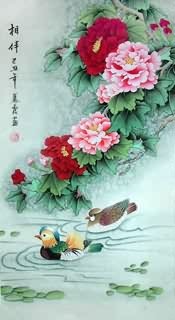 Mardarin ducks were called birds of love in ancient China. Paired mandarin ducks are as close as body and shadow. They fly together, swim together and sleep with their necks crossed. They pair for life. The bird will remain single if his or her mate dies. Because of this, mandarin ducks have become symbols of marital fidelity in China. 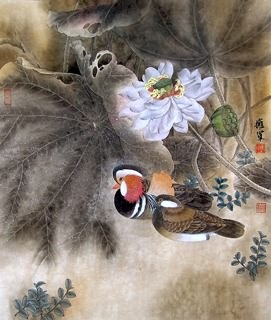 Chinese Mandarin Duck Painting: 鸳鸯戏水. 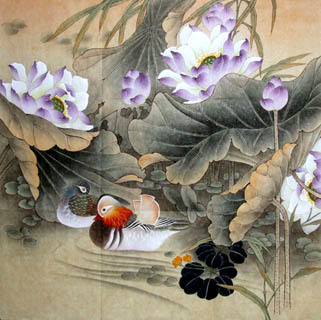 As emblem of happy marriage, mandarin ducks have long been one of the typical themes of Chinese art. People usually present pictures of a pair of lovely mandarin ducks sporting in water to a newly married couple by way of wishing them perfect conjugal bliss. 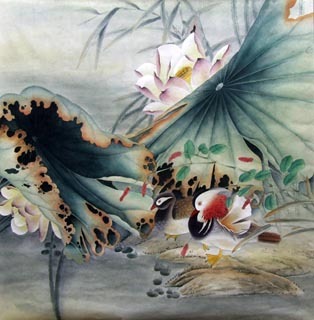 Chinese Lotus & Mandarin Duck Fengshui Painting: When mandarin ducks are depicted with lotus, the lotus (he 荷) homophonous with the he (和) that means "harmonious", this design stands for the harmonious and affectionate couple. 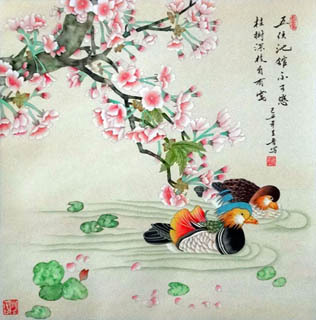 Chinese Sweet Osmanthus & Mandarin Duck Feng Shui Painting: Mandarin ducks combines with sweet osmanthus, which represents a couple are faithful to each other till the hair turns grey, and their offspring achieve success. InkDance Price: USD 470 /GBP 386 /EUR 447 Sold, you can customize it. InkDance Price: USD 510 /GBP 419 /EUR 485 Sold, you can customize it.